There’s an old adage when it comes to personal finance – don’t think of your house as an investment. Instead, the right way to think about your house is as a nice place to live. The idea here is that housing markets are volatile, and there are a number of hidden costs when it comes to home ownership – taxes, maintenance, renovations, and even furniture! Of course, by owning property you also have the opportunity to tap into accrued equity, and a reasonably liquid fallback for when times are tough. It’s apparent that conventional investment equities such as stock markets, bonds, and the money markets do have fewer hidden costs, both transactional and over the course of ownership. Conceptually, it makes sense – if you’re buying securities through a broker and/or in securitized funds there may be transactional fees or maintenance fees, but you pay taxes only on the basis of realized gains, dividends, and distributed capital gains. On the other hand, property taxation is such that even if your property has lost value you’re likely to still owe some degree of taxes. With all this in mind, the degree of capital appreciation that real estate experiences over the course of the ownership life cycle can easily get lost. Let’s take a look. Is Housing Really That Volatile? Let’s examine the belief that housing markets, as a class of securities, are volatile. The Case-Shiller National Home Price Index tracks the reported price of home sales across the country, normalized to a value of 100 for the year 2000. As you can see below, the national price index (going back to 1987, the first year for which data is available) tells the story of quite a wild ride, especially recently. Another interesting thing to notice is that traditionally, economic recessions (indicated by the highlighted grey areas) are not associated with a decline in home prices. The great exception here, of course, is 2008. Recent history also challenges the notion that declines in home value are accompanied by economic recession. The local minimum for housing prices between 2008 and today was actually in 2012, over two years after the recession of 2008-2009 formally ended. Analyzing the Case-Shiller National Home Price Index as a measure of historic asset volatility makes a lot of sense if you’re trying to assess risk from a securitization standpoint. However, doing so fails at the individual level because most individual don’t treat their property as a security-like asset. That is, while the purpose of a security is to be bought and sold, and to be held until such time that either prudent risk management dictates its disposal or a decision is made to take profits, individuals own property to for the purpose of living in and enjoying it. To correct for this, the approach to take is to project the purchase-to-sale interval as the length of time in which a buyer is expected to inhabit their property before reselling it. As a purchaser, they are subject to the economic environment of their original purchase, and when they decide to sell they will have to contend with the market conditions of the time. The National Association of Home Builders projects this interval as thirteen years between purchase and sale. Knowing this, we can calculate the expected return on capital from a home purchase in the US. We can then compare it to any number of different assets that might otherwise have been an outlet for investment – namely the S&P 500 component index, which constitutes weighted equity holdings in five hundred diverse large companies. The S&P 500 is largely considered the standard for measuring against the health of the economy as a whole. We also need to adjust for inflation, which has a tendency to dilute returns by reducing the purchasing power resultant from capitalizing on long-term holdings such as property. FRED (Federal Reserve Economic Data) provides the HOSMEDUSA052N dataset, which comprises the medium purchase price for homes annually since 1989. 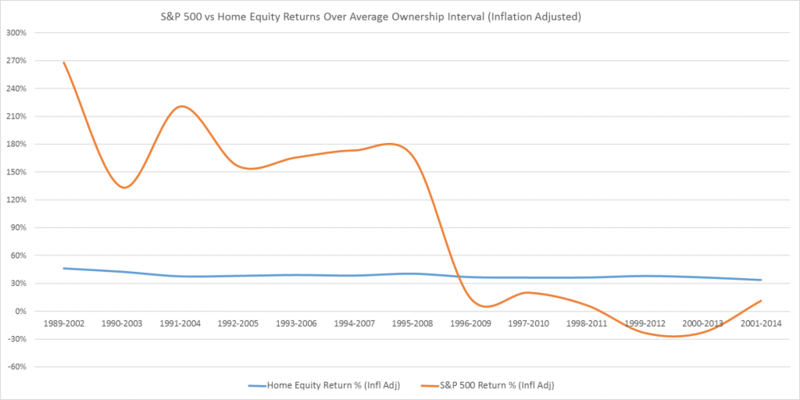 By pulling forward values along the 13 year interval, I calculate the total return on equity assumed by purchasers turned sellers over the life-cycle of their ownership. I then compare this to the value of the S&P 500 on January 1st of both the purchase year and sale year. Finally, both returns are adjusted for inflation using the Consumer Price Index (CPI) for January of each year as reported by the US Department of Labor’s Bureau of Statistics. What immediately sticks out is that return on capital when it comes to housing is remarkably consistent over time after adjusting for inflation. People who sold their houses in 2014, having lived there on average since 2001 can expect a 33.59% return on capital. This is the lowest point in the range, whereas the highest point, for 1989-2002, is a 46.24% return. On the other hand, the S&P 500 returns for the same interval swing widely. The data shows that between 1989 and 1996, the stock market was likely the better investment from a capital appreciation perspective. On the other hand, between 1996 and 2001, investing in property would likely have outperformed the S&P 500. It remains to be seen how stock market volatility from 2008 onwards will affect the calculus of housing volatility. This is an especially interesting metric to track because prior to 2008, economic recession was not necessarily correlated to any dramatic change in housing prices. In fact (as Case-Shiller data shows), historically housing prices have been only marginally affected by economic recession. Another point of emphasis is the dramatic effect that inflation has on returns on capital in this historic time frame. See the raw data below and note the difference between the real value and the adjusted values. Looking at this data, it is very easy to make the case that, from a monetary policy standpoint, inflation is something worth getting right. Now, of course, the caveat to all of this is that the concept of “return on capital” only really makes sense in this application if you paid in cash and in full for your house, which the vast majority of homebuyers do not. But that’s an analysis for another time! Nice post. Just a point of nomenclature, typically when economists say real returns that means inflation adjusted. Nominal returns would be not adjusted for inflation.